Their latest plan -- including a one-year delay to Obamacare's individual mandate -- is dead on arrival, and they know it. We're about eight hours from government shutdown, and not only is there little progress toward averting it -- things seem to be moving backwards if anything. Politico reports that House Republicans are considering a bill that would cancel health-insurance subsidies for congressional staffers and, more importantly, delay the individual mandate in Obamacare for a year. This is a slight concession for the right. First, hardliners demanded a total defunding of Obamacare. Then they wanted to delay it for a year. Now they just want to delay the individual mandate for year. But make no mistake: It's a proposal that will hasten a shutdown, not forestall it. The problem is that though Republicans are gradually reducing down their demands, they're doing it far too gradually given the time remaining on the clock. A one-year delay of the individual mandate would have the same effect as delaying the entire law by one year, so there's still no chance that Democrats will agree to it. Some Republicans seem to think that if they keep trying, Democrats might eventually cave. The problem is that there's no evidence to suggest the Senate would ever accept such a radical alteration to the law, so voting for this plan this late in the day (it will be no earlier than 6 p.m.) is essentially an endorsement of shutdown. 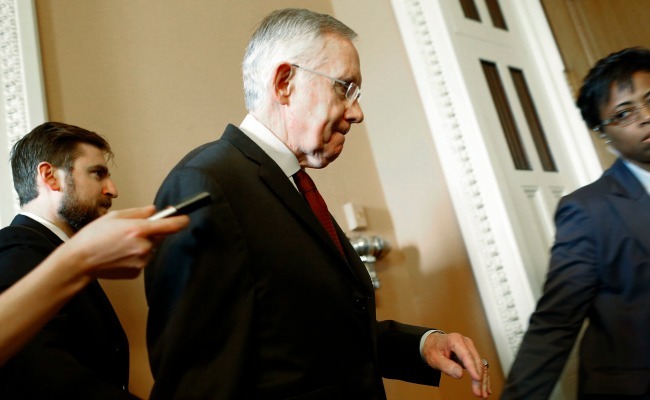 Some conservatives are trying to make a case that Senate Majority Leader Harry Reid, with his implacable opposition to anything besides a "clean" continuing resolution, is the one who wants to shut the government down. That was already a hard case to make. But it's even harder to imagine with a bill like this. Here's a quick rundown of what else has happened this afternoon. Republicans have floated the idea that the Senate might consider a continuing resolution that only stripped congressional staffers of their Obamacare subsidies, or did that together with the repeal of a tax on medical devices. Reid has ruled that out. Meanwhile, the Senate reconvened, took up the bill the House passed this weekend that included a one-year Obamacare delay and the repeal of a medical-device tax, and promptly stripped out the Obamacare-related provisions, sending a basic spending bill back to the House. Separately, Senate Minority Leader Mitch McConnell suggested a one-week continuing resolution that would keep the government from shutting down and allow further negotiation -- or really, initial negotiations. Reid has shot that down, too, though White House Press Secretary Jay Carney didn't completely rule it out (he didn't rule it in, exactly, either). It's hard to see the incentive for anyone to back this. Democrats seem increasingly convinced Republicans will either blink now or else will surrender once there's a shutdown and (Democrats presume) the GOP is blamed for it. But there's little reason for Republicans to believe it will help their policy objectives either: Why would Obama and Reid be willing to fly the white flag in one week if they aren't now? Plus, the Obamacare exchanges will be up and running starting tomorrow, meaning it will be even harder to stop the law. During the fiscal-cliff negotiations, McConnell swooped in at the last moment and brokered a deal. This time, he's grappling with a Tea Party primary challenger and has stayed on the sidelines. And lo and behold, conservatives are already furious at the one-week idea. Finally, a one-week continuing resolution would mean the next shutdown deadline would come with just 10 days left before the nation reaches the debt ceiling, adding more danger to an already perilous situation. Of course, the situation is fluid. Perhaps another volley of unsuccessful bills will convince enough Republicans in the House to support a"clean" continuing resolution. In fact, it's quite possible that if the such a bill were put to the House right now, it would pass with a majority. Representative Charlie Dent, a Pennsylvania Republican, has been attacking his party's right wing and shouting to any reporter who will listen that a large number of Republicans would vote for a "clean" continuing resolution, without any additional changes. So if there are votes to pass a clean CR and no one wants to shutdown the government, why isn't that happening now? Basically, Speaker John Boehner doesn't want to lose his job. If he passes a clean CR with mostly Democratic votes, he risks a serious insurgency among Republicans and could lose the speaker's gavel. He doesn't need his entire caucus to vote for a clean CR, but it's estimated he needs at least about 120 GOP members to back his plan to make his position politically tenable. For the time being, Republicans have painted themselves into a corner where that seems like surrender; Dent seems like an outlier now. Wait another seven hours and that may change -- but it sure doesn't seem likely at the moment.